We humans can learn a lot from penguins. They’ve mastered the art of staying cool and avoiding the dangers of overheating. Some penguins can raise or lower each feather individually, allowing body heat to escape. Others release heat by raising one or both wings. Still others have bare skin around their eyes that serves as a heat escape hatch. The human body is equipped with unique ways of coping with the heat, too, such as sweat glands. But most of us in NJ prefer escaping the blistering heat completely by retreating to the sanctuary of our perfectly chilled homes. From air conditioning replacement and installation to air conditioning repair and maintenance, with our full menu of services, we outperform those other air conditioning contractors in Hunterdon County and in Somerset, Mercer, Morris and Warren counties. Plus, we’re ready to glide on over to handle all of your cooling needs 24/7 and we offer a 100 percent guarantee. Maybe your air conditioner broke down unexpectedly on a hot summer day and you and your family in Flemington, Clinton, Bridgewater or beyond have been reduced to huge puddles of sweat. Or maybe your system has outlived its best years and isn’t providing you with the reliable and affordable AC that you deserve. Either way, it’s no sweat for our team of talented techs at Air Professionals. 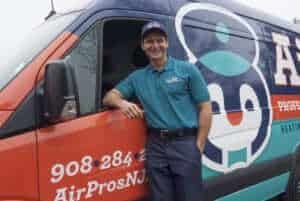 We are the air conditioning contractors Hillsborough and other Hunterdon County homeowners want on your side. We have the expertise in air conditioning installation and air conditioning replacement to get your journey to chilled relief back on track. Has this ever happened to you? At the end of a long, hot day at work, running the kids around or chipping away at your to-do list, you’re looking forward to opening your front door and feeling that refreshing blast of reliable coolness. But when you arrive home in Hunterdon County or the surrounding area, your house feels more like a sauna. Your AC system’s performance is sliding downhill—fast. But before you get too hot under the collar, call in your feathered friends at Air Professionals. We have the coolest techs and the hottest air conditioning repair services available to turn that sweatbox into the cool, comfy igloo you deserve. If there’s one thing we’ve learned in our 20-plus years in this business, it’s to sweat the small stuff. Yes, you read that right. We said you should sweat the small stuff. Here’s why. You depend on your air conditioner to keep you and your family comfortable throughout the sizzling summer months in Hillsborough and across this area. When your system goes on the fritz, it’s just not cool—literally. It’s also inconvenient and expensive. We can keep those costly repairs and breakdowns to a minimum (or even eliminate them altogether) with our top-of-the-line AC maintenance services. No ductwork? No problem! We specialize in dependable, affordable and versatile ductless mini-split systems that are quiet, easy to install and can be significantly more energy efficient, costing as much as 40 percent less to operate. These mighty workhorses also do an incredible job of improving your indoor air quality by reducing the amount of contaminants that wiggle their way into your home through the ductwork. Don’t let the name of this handy HVAC system throw you off balance. Heat pumps aren’t just about keeping you warm and toasty during winter’s epic blasts. They also pack a powerful punch in the summer months when Mother Nature kicks up the heat.